Normally, I would not consider using black for a Valentine’s card, but this shimmery black paper has romance written all over it! I found these red glitter alphabet stickers at Michael’s, and I had a vision of a creamy, sparkly card with the word “Love” on it. 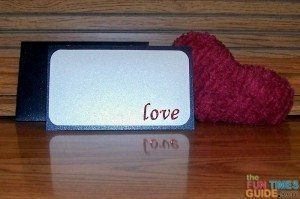 Initially, I wanted to make a cream colored Valentine card with the rectangular panel popped up on foam dots — to give it some dimension — along with these delicious red letters. Then, I remembered that my shimmery cream paper is only shimmery on ONE side. That meant the inside of the card would have been a blah matte cream. I could have added a shimmer panel to the inside, but the top part of the inside would have still been dull and that’s not the look I wanted. So I turned to the black paper, and fell in love! The black shimmer paper is sparkly on both sides, so the inside of the card looks as good as the front. 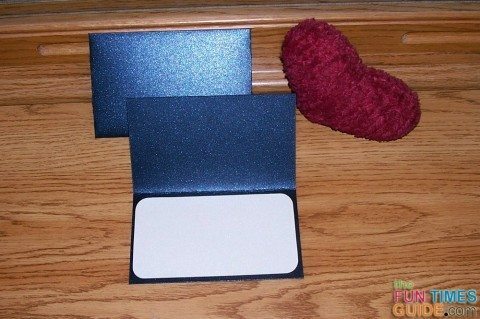 The card base is 5.5″ x 6.5″, cut so the front of the card is 5.5″ x 3.25″. The cream panel is 5.25″ x 3″. I used the Plantin Schoolbook cartridge in my Cricut Expression to cut a 3″ blurb shape. Then, I used a sharp pair of scissors to cut off the extra tag, as seen here. 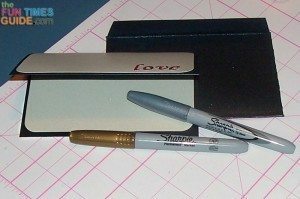 To make a similar rectangle without a Cricut, you could cut a regular straight-edged rectangle and use a corner rounder punch. Or, use any round object (a coin, soda cap, small bottle) to trace a curved edge on one corner of your regular rectangle shape, then trim. Next, on the back side of your cream panel, line up the corner that you just cut off on top of the other 3 corners — one by one — and trace with a pencil. Follow your pencil line to cut the remaining 3 corners. 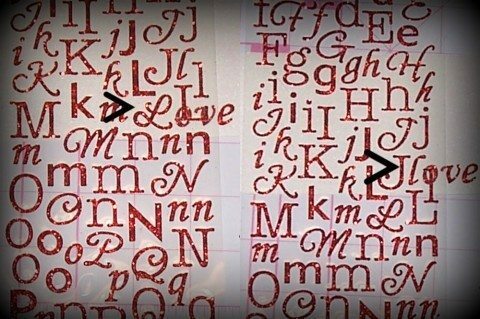 The red glitter stickers offer a variety of fonts and styles of letters to choose from. I chose the 1/2″ lower case curved letters. One thing I love about stickers like this is that they are packaged on a clear background. That allows you to consider options before you remove and actually use the stickers. I considered using the capital L, but decided I preferred the lowercase version instead. For another elegant touch, use Sharpie metallic markers to write your message on the inside panel. They come in 3 colors: gold, silver and bronze. After you have fun making your shimmery black Valentines card, you will have plenty of leftover alphabet glitter stickers for other fun projects!